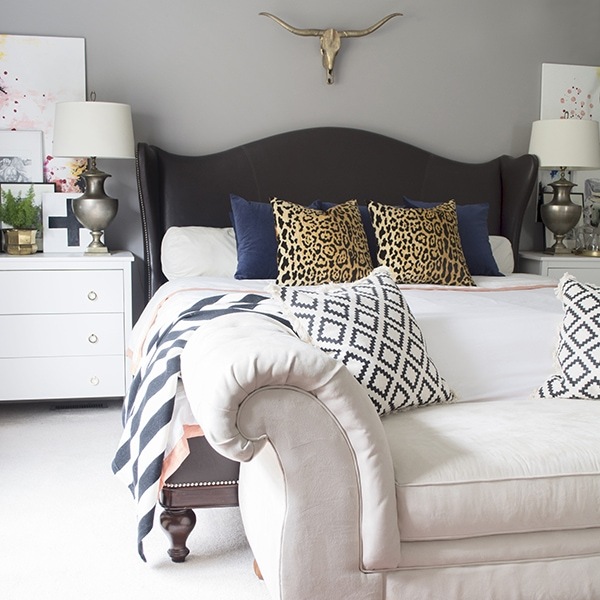 I”m so excited that it is Blogger Stylin Home Tour time. If you are coming from my friend Summer’s blog Simple Stylings then I’m welcoming you with all my heart. I myself love clicking through all the tours and seeing different styles. It’s so much fun. But I haven’t been doing much for spring decorating myself because I was decorating outside for the HomeDepot Patio Style Challenge. Just some little changes inside here and there. Let me show you. The green leaf pillow is actually a bed pillow sham that I bought last summer. This is the first time I’m using it and the colors are perfect for spring and summer. 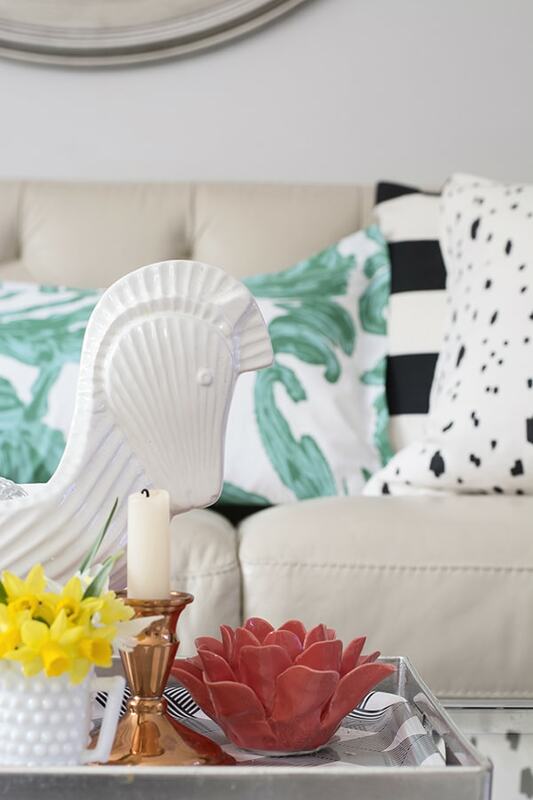 If you would like to see my obsession with rearranging pillows on my sofa then you can click HERE to see all the different looks. I added some things to my shelf styling. Click HERE to see what this shelf look like when I bought it at a local auction. 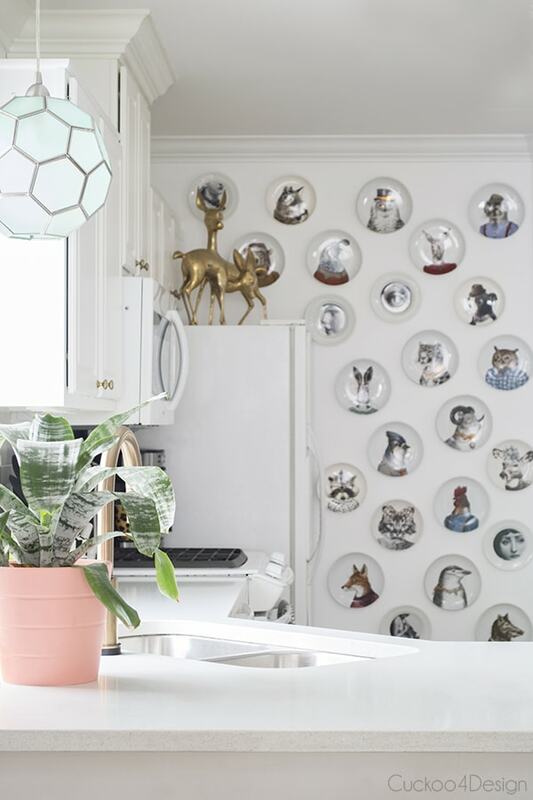 I think most of you saw that I painted the animal plate accent wall white recently. And you can find the plates HERE, HERE and HERE. 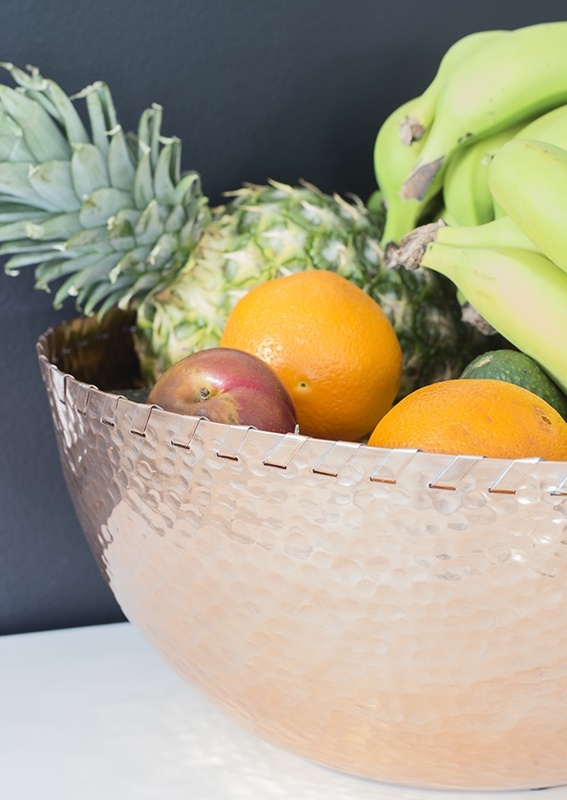 I’m so thrilled about the copper bowl I just found at HomeGoods. My dining area is still a work in progress more than the other areas because I can’t make up my mind. I just painted the 48×48 painting and also decided to remove the smaller dining table and put the old glass auction table back in. The Craigslist chairs might get reupholstered yet but I’m not sure. Click HERE to see the full garden post. Before that I had it in my attic since I moved here 18 years ago and I feel like it looks good in our bedroom. Don’t know if it will stay in there because I caught Heidi-cat wanting to pee on it the other day. For now I love it. 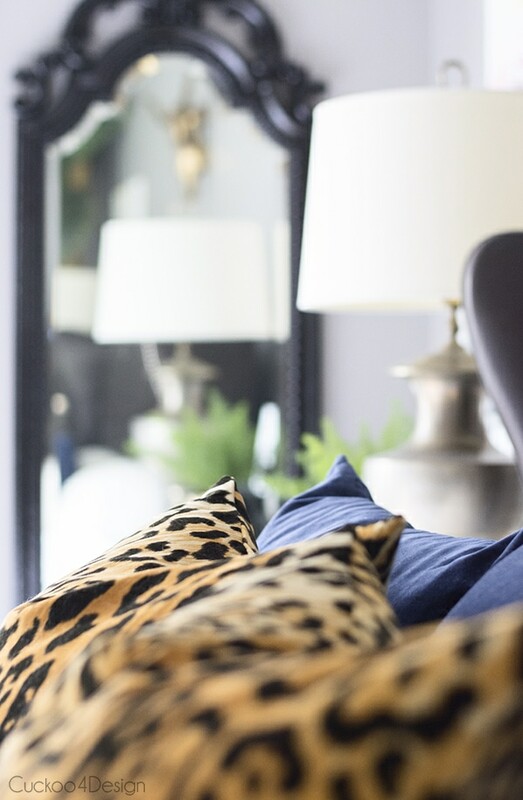 Even though you have been seeing the leopard pillows all over my house already in photos, I originally bought them for the bedroom but can’t help playing the pillow shuffle with them everywhere. I think I need more! And I’m so in love with the blue velvet H&M pillows (they don’t carry them at the moment). 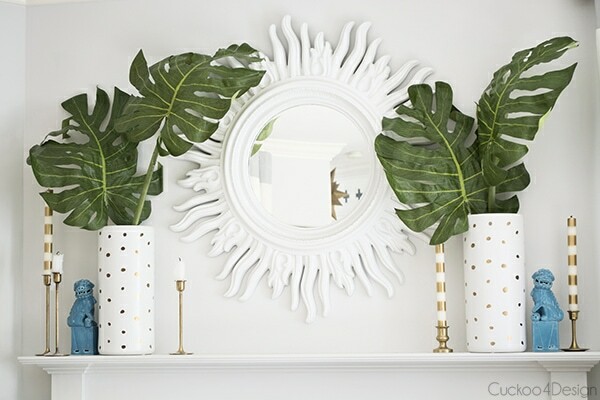 It’s definitely not a specific spring decor but it’s a change and that’s what I crave. The geometric pillows are also H&M. 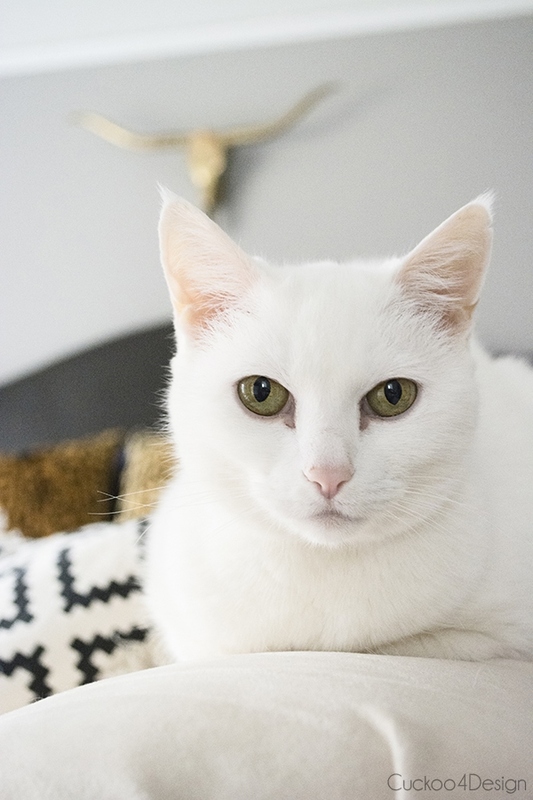 Click HERE to see how I reupholstered the chaise. If you are wondering about my bed, it is this bed HERE which isn’t always available. Like I mentioned above, I was working on my HomeDepot Patio Style Challenge and that is why I don’t have too much Spring decor going on in the inside. Here is a little sneak peek. The post is live on their blog. (click HERE to see it) And don’t worry, it’s not Halloween decor like some people called me out on Instagram already. There is also lots of blue in the mix. 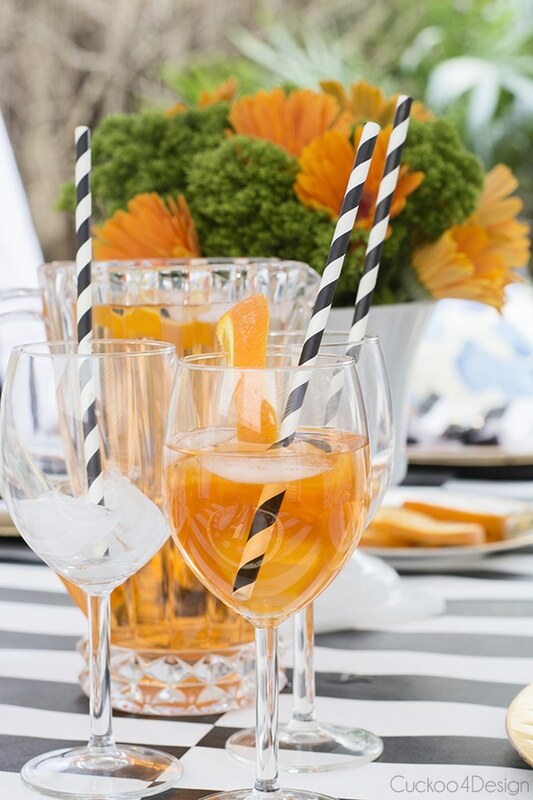 Have you been following the HomeDepot Patio Style Challenge? Click HERE to see more of my home and get information about the colors I used. I hope you enjoyed seeing the little updates throughout and that you will continue on the tour by visiting Laura at Avery Street Design (click HERE). Have fun, enjoy and feel free to share with your friends who might also like to see all the spring home tours. Everything is just perfect Julia! I love seeing your home everything and I love the musical pillows, the green leaf ones are my favorite 🙂 I’m still stunned by your artwork, I wish I had half your talent! Fabulous tour friend! 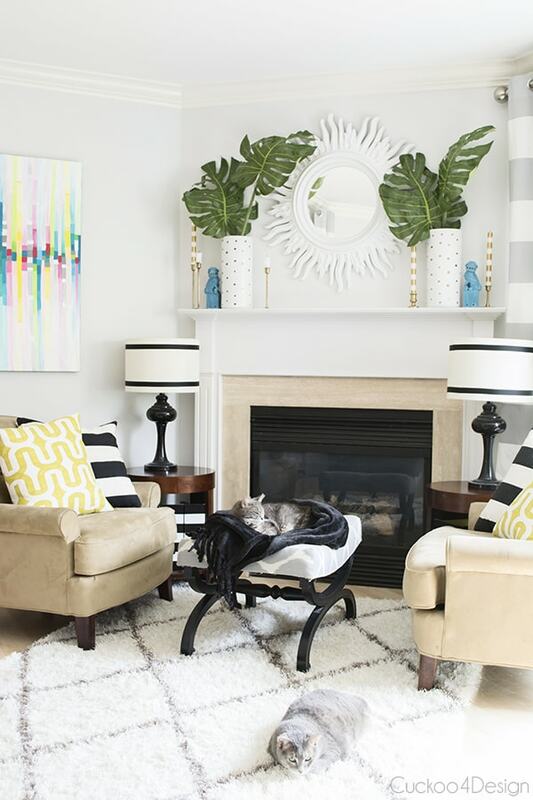 I am loving all the pops of colour in your home with the black and white as a contrast! You never fail to amaze me with your style! So beautiful Julia!! I always love taking a glimpse into your gorgeous home. It makes me smile. So amazing, Julia!! !everything looks flawless! And your photos are so bright and detailed! Your styling kills me. It’s so good! Love the artwork on the floor in the living room. 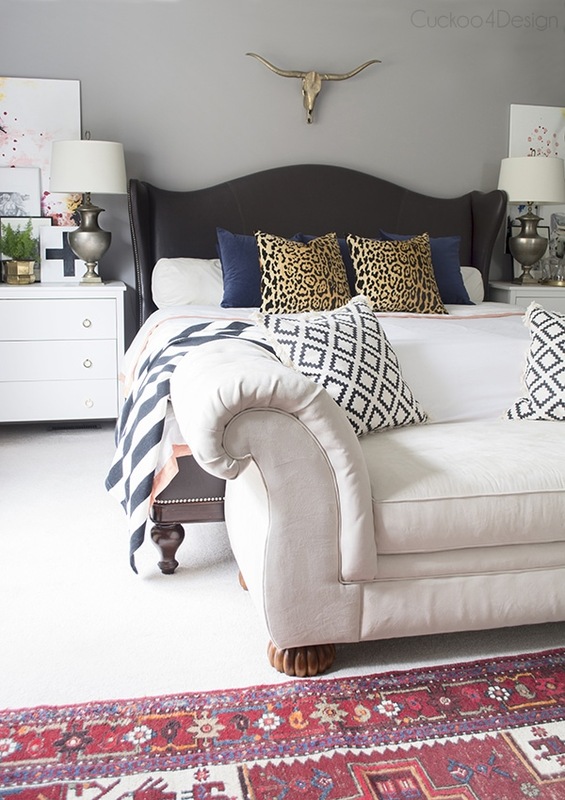 Every room is just fab! Thanks Gretchen, that bowl fits a crazy amount of fruit. I just love your tour Julia. So much beauty at every turn. I gotta say though, the dining room is maaaajorly swoonworthy. I looove the table and chajrs and i really love the sputnik you like too. As a maximalist im all about just going for it with the gold. 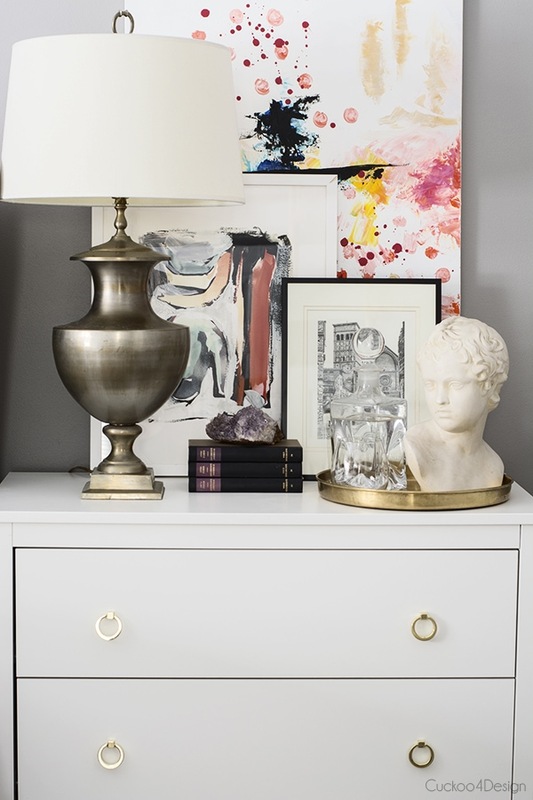 Your home is totally meant for that gorgeous fixture. I couldn’t love your style more Julia!! It’s bright and fun but at the same time so chic and your styling is top-notch! And, the art you’ve created is totally blowing me away!! Julia, I am so blown away by your tour, seriously! It is all so gorgeous! I love your kitchen, bedroom, living, and THAT GARDEN shot! Amazing style, friend! Thanks so so much Lindsay and thank you for including me again. 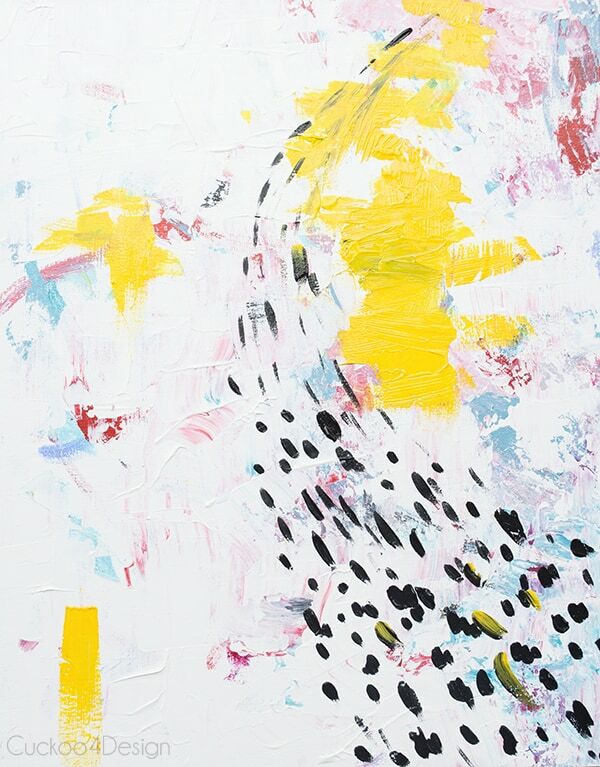 Beautiful…I am a fan of your use of bright and cheery colors. Julia, everything looks so gorgeous! And your paintings are amazing! 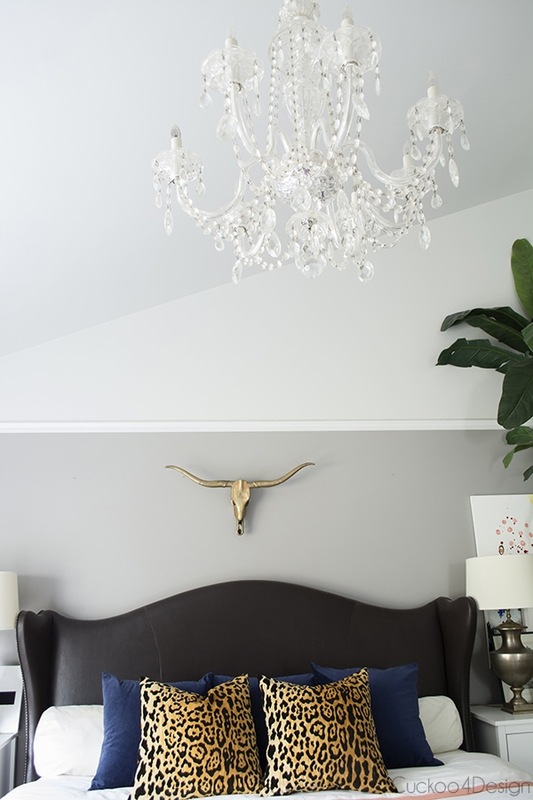 Julia, holy cow…every room is to die for. I can’t say enough good things- my jaw is basically just hanging open right now. 🙂 LOVE everything about your home! Everything is just stunning Julia…I love your artwork, too!! You’re such a pro, and have such a great eye for color and styling. FABULOUS! you’re so talented Julia! I STILL can’t believe you upholstered that chaise, so legit. Love all the spring touches you added! Thanks so much Brittany and thanks for the visit. Means the world coming from you! So beautiful! I love everything about your home. Gorgeous! Oh thank you so much for the visit and sweet comment Erin. Julia it is all so gorgeous! You just have that flair, it makes everything so designer! Everything is beautiful Julia! 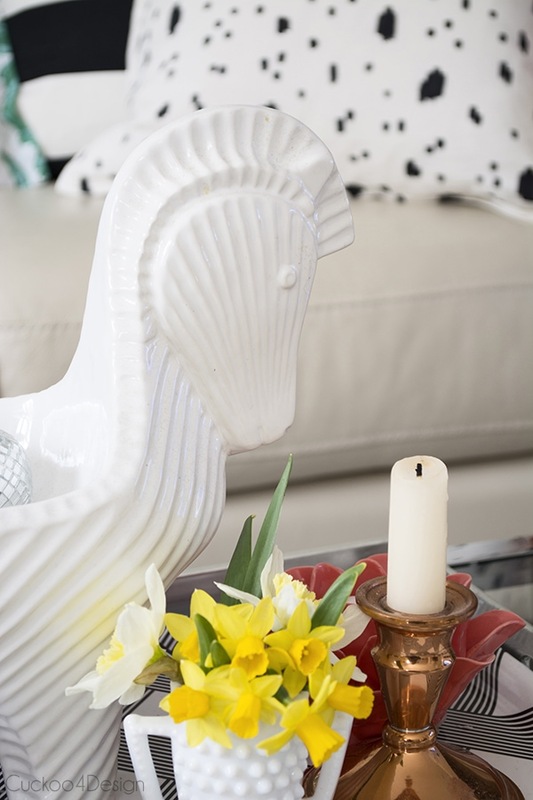 Love seeing how you changed things up for spring! I feel the same way about the leopard pillows I have like that. I could use them in every room in my house! I love your style, so pretty. 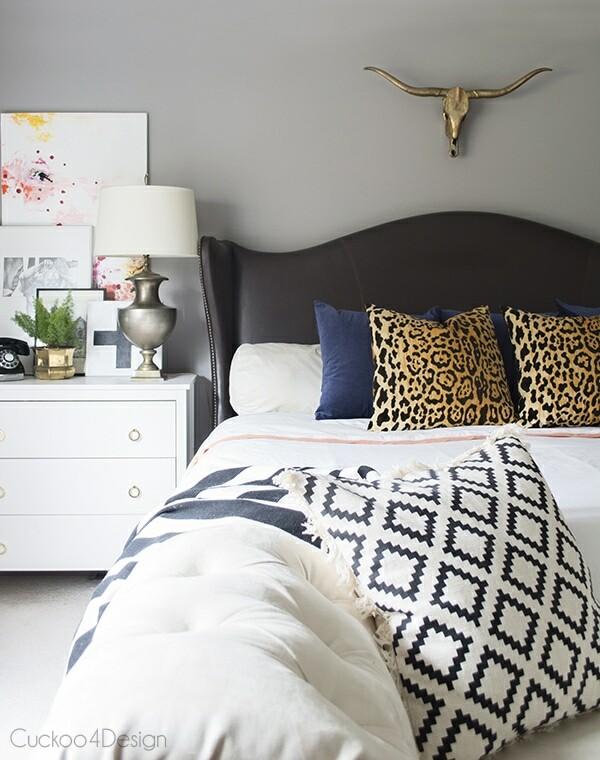 Every room is put together and accessorized so beautifully. Stunning pics. Every room is stunning! Besides your artistic talent, the upholstering is amazing. Love every room! Your home is so beautiful! I love your disco ball. I wish I had one like it! Mine is from NYC but you should buy one online. They are so fun. Such a bright, happy, colorful home! I LOVE all your DIY art (but I think you already know that). The GIF came out great too! I haven’t tried those yet but love how they show the evolution of a space or object. you don’t even need to do any GIFs because you are awesome at video tutorials. I’m really loving the colors you’ve been using lately. I’ve been in a black and white kick lately, but you are making me want to use all the color!! Beautiful tour Julia! 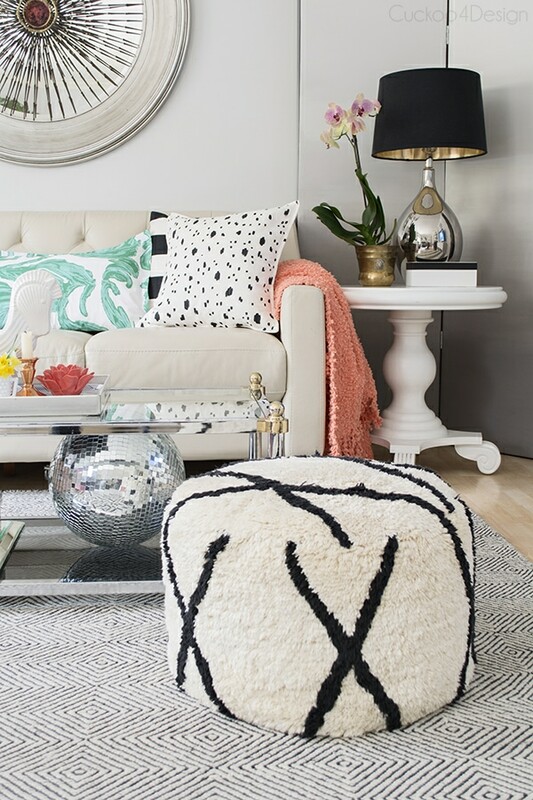 Totally loving all the fab patterns throughout your space. Beautiful! Thanks so much for the visit Michael. Means the world coming from you. Your house is so gorgeous. Gah your home is so perfectly styled. I can never get enough of your glorious home!! Off to go spy your outdoor space! Julia, it’s all just stunning! I love the mix of colors in the living room, and you know I’m crazy about those brass chairs in your dining room! And your art is just perfection! I really really want to commission you to make me a piece for my house the next time I’m not strapped for cash 😀 Everything is so beautiful in your house tour!!! Thanks so much Brynne, you are the sweetest! Thank you so much Lucy for the sweet comment and visit. Have a great weekend. so schön Julia. Besonders toll ist die Wand in der Küche mit den ganzen Tellern mit Tiermotiven. Gorgeous tour! Your paintings looks so amazing, too. 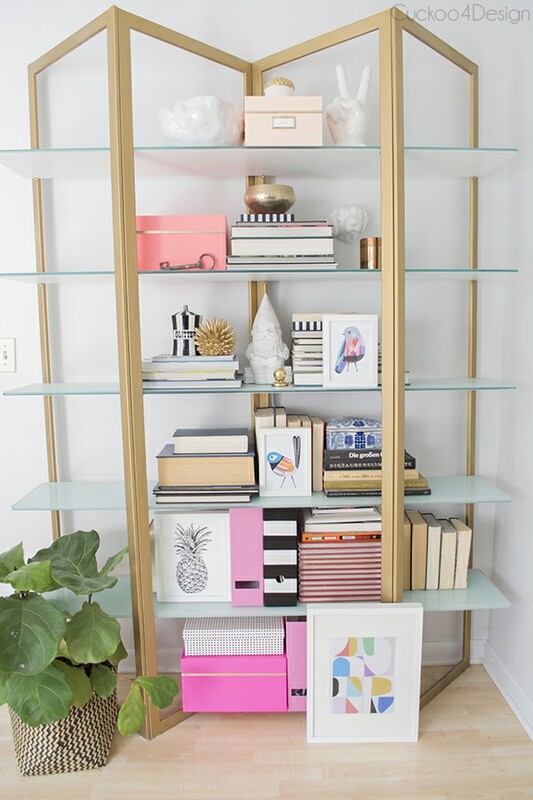 I am LOVING that gif you made while you styled your shelves. That is always something I struggle with. Julia, your artwork!! It’s amazing!!!!! 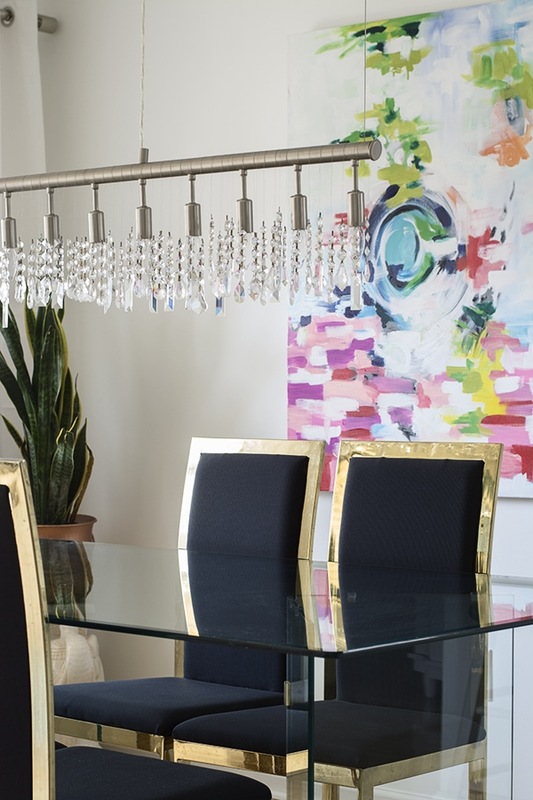 I love that big piece you painted for your dining area, it is so beautiful!!! It totally makes the room come alive. You are seriously talented! 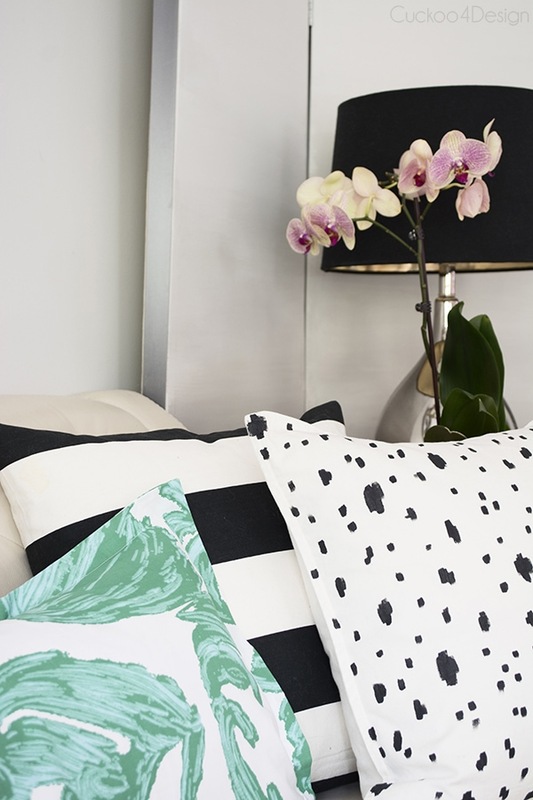 Your home is so pretty, love your pillow change ups, the green/white & black/white in your living room and the navy with leopard in the bedroom, so good. 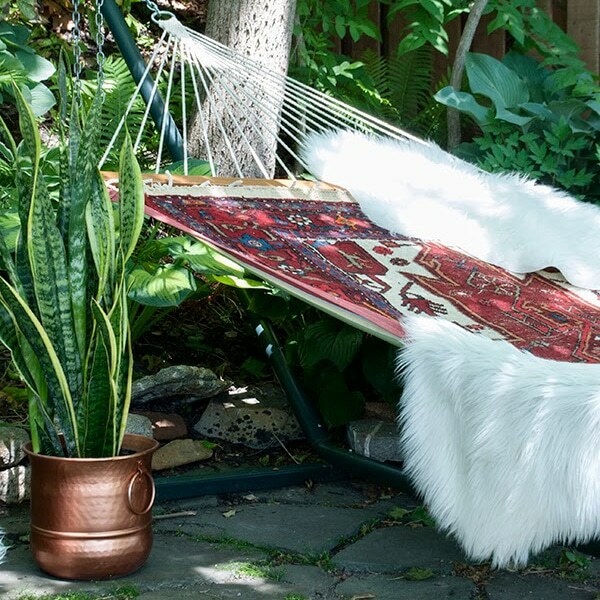 Also I’m just dying over your outdoor area…..makes me think this is the year my husband will get a hammock for father’s day (all styled up of course!) 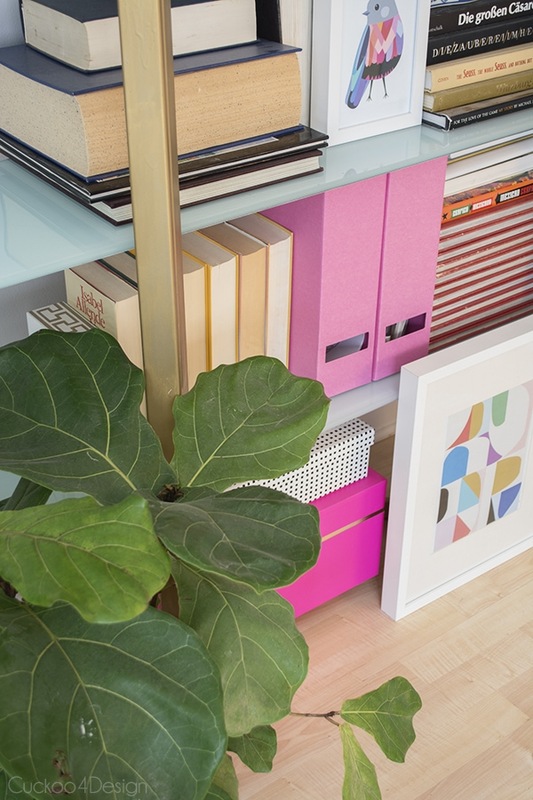 Enjoy your creative and gorgeous home. Awww thanks so much and yay for father’s day and hammocks. You should totally get one. I’m dragging behind the past couple of day because I don’t have a computer. Ugh! 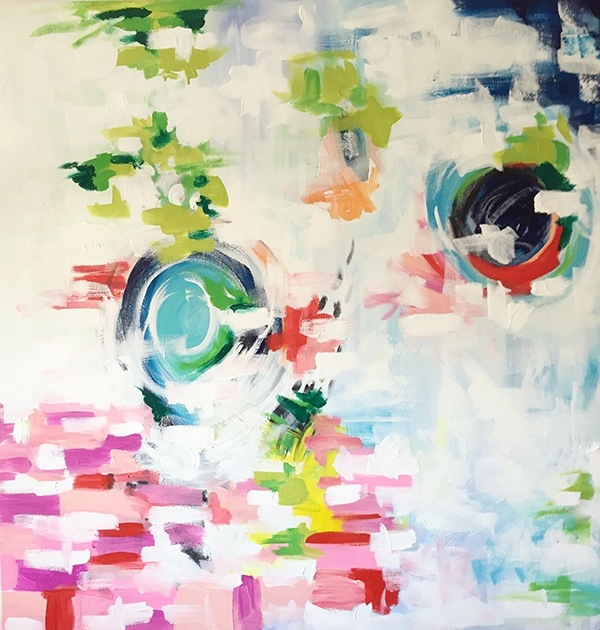 Julia, your home is beautiful…but those paintings are incredible! You have a real talent, my friend! Thanks so so much Gwen and also for the visit. So pretty!! 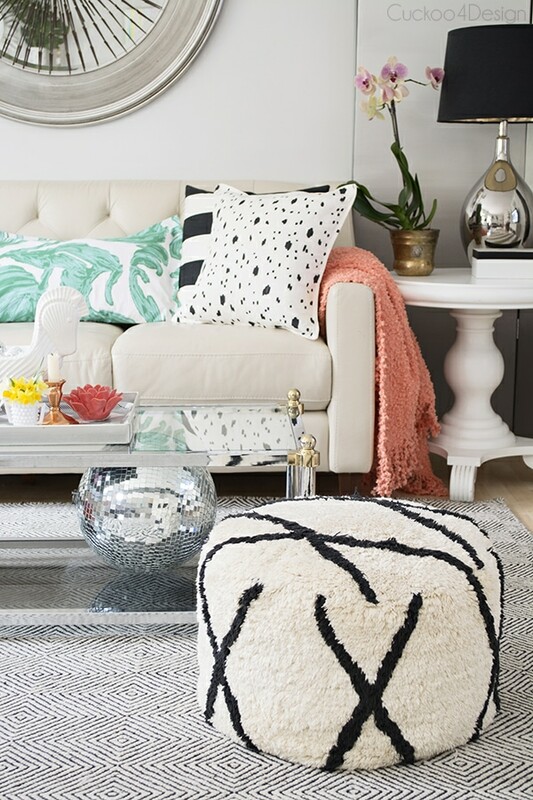 I love the pillows in the living room and the color combo there! I want the foot stool. Amazing home, Julia! I’m dying to know what the name of the color is in the bedroom! I’m desperately trying to find the perfect gray. Please tell! Hi there, my bedroom color is called Rocky Bluffs by Valspar and thanks so much for the sweet words. Hi! I love the rug in your living room! I know it’s the Sierra Paddle Rug but I was wondering which color? Thank you!!! It’s black and ivory and I love it! Awesome thanks!! It looked more gray than black and on the website it looked like there were two grays and the black looked very black! I just wanted to double check before I ordered it! On the website there is an ivory, gray and a black one….you got the black?